There are many types of muscular dystrophy (MD); all are caused by errors in genes (the units of inheritance that parents pass on to their children). In Duchenne muscular dystrophy (DMD) lack of the protein dystrophin causes muscles to deteriorate and break down, leading to progressive difficulty with walking and general mobility. DMD is the most frequently occurring and one of the most rapidly progressive of the childhood neuromuscular disorders. It affects approximately 1 in 3500 live male births throughout the world. Due to the way that it is inherited, DMD affects mostly boys, but occasionally girls are affected. Are there other problems associated with DMD? Is there a cure for DMD? What will management of a child with DMD involve? What can we do to help our son? What about the needs of the rest of the family? There are often difficulties with diagnosis in DMD because the symptoms may vary and where there is no family history DMD may not at first be suspected. It is quite common to see a delayed walking age with first steps being taken at around eighteen months. Once a boy with DMD is walking he may fall readily. He often has difficulty climbing (stairs for example), difficulty running and jumping, and he may develop a ‘waddling’ gait. Classic symptoms include enlargement (hypertrophy) of the calf muscles, which occurs in about 90% of cases. He may develop a tendency to walk on his toes and this is often accompanied by a protruding abdomen and sway-backed stance, called ‘lordosis’. He may experience difficulty getting up from the floor without help, he may use his hands to climb up his legs for support – this is referred to as ‘Gowers sign’. These symptoms generally begin to develop between the ages of one and three years and continue to progress until he requires wheelchair support, most often between the ages of eight and twelve. Laboratory tests for DMD begin with the measurement of a muscle enzyme called creatine phosphokinase (CK). CK leaks out of damaged muscle and is found in large amounts in the blood. A blood test will reveal a CK level which may be 50 – 100 times greater than normal. Although this enzyme is often slightly raised in other types of dystrophy (including the associated Becker muscular dystrophy) the increase is far greater in DMD. Approximately 70% of DMD carriers will also show a slightly raised CK level. Therefore a high CK level suggests that the muscles themselves are the likely cause of the weakness, but does not tell us with a 100% certainty what the muscle disorder might be. Initial DNA tests will pick up deletions and duplications which are by far the most common types of mutations. The rarer point mutations will need further investigation using different techniques to analyse the DNA. It could take a lot longer to obtain a genetic diagnosis of a point mutation, especially if there isn’t a family history of DMD. It is important to obtain a genetic diagnosis for several reasons. Firstly, it will allow other family members to be tested to determine the risk of passing the condition on to future children. Secondly, much of the current research into treatments is focusing on therapies that are specific for a particular mutation so a genetic diagnosis will determine whether a boy can participate in a clinical trial or eventually be prescribed a particular medication should it prove to be an effective therapy. On very rare occasions when DNA studies do not present a clear picture a muscle biopsy may be required. A small piece of muscle tissue is taken with a needle, usually from the thigh. Using special staining techniques in the laboratory the muscle tissue is examined microscopically for dystrophin protein. In DMD, dystrophin is completely absent while in the related disorder Becker muscular dystrophy some dystrophin is present. Therefore, the muscle biopsy test is important in providing a definite diagnosis when DNA tests are inconclusive. In DMD the faulty dystrophin gene is ‘X-linked’, meaning that it is situated on the X chromosome. Females have two X chromosomes one inherited from each parent. In most cases females who inherit a faulty dystrophin gene will show no symptoms of the disorder. This is because the normal dystrophin gene on her other X chromosome will be predominant and function to produce dystrophin. Women with the faulty dystrophin gene on one of their X-chromosomes are known as carriers and she can pass the condition onto her children. The daughters of carriers each have a 50:50 chance of being carriers. Occasionally female carriers have a mild degree of muscle weakness, usually limited to the shoulders and hips, and these women are known as ‘manifesting carriers’. Males have one X chromosome which they inherit from their mother and one Y chromosome which they inherit from their father. 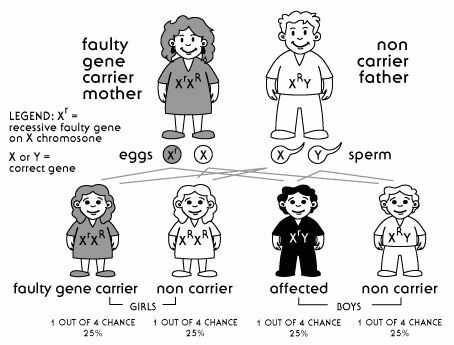 If a boy’s mother is a carrier of a faulty dystrophin gene there is a 50:50 chance that he will inherit this gene and will have DMD because, unlike females, he doesn’t have another X chromosome to make up for the faulty one. Please see the diagram below which illustrates how DMD is inherited. If a male with DMD were to have children with a non-carrier female, their sons would not inherit the condition and their daughters would all be carriers. In approximately one-third of DMD cases the genetic fault is not inherited but arises in the affected boy himself and then it is known as a ‘spontaneous mutation’. Soon after the diagnosis of DMD it is essential that genetic counselling is arranged, together with appropriate tests for those members of the family who are at risk of being carriers. Genetic counselling provides information on the inheritance pattern, risks to other family members, and the ‘prognosis’ (likely outcome of the disorder). Family members that are found to be carriers of the condition can discuss with a genetic counsellor family planning options to reduce the risk of passing the condition on to future children. This may include utilising new technology called pre-implantation genetic diagnosis which is used in conjunction with IVF. Around 10 to 20 percent of female carriers of the DMD gene mutation experience some of the symptoms of muscular dystrophy and these women are known as ‘manifesting carriers’. Symptoms include mild muscle weakness, fatigue (a tired feeling), or cramping in their muscles. It is also estimated that 10 to 50 percent of carriers have changes to their heart. Therefore it is advised that all female DMD carriers seek evaluation by a neuromuscular specialist and a cardiologist so that any problems can be picked up early and treated. In the early stages, boys will be able to walk, run and play with their peers but they will show several signs – they will walk on their toes with a waddling gait, have difficulty getting up from the floor and be slow to climb stairs. By about 8 to 11 years (sometimes earlier or a little later), a wheelchair will be required. As the condition progresses arm function and maintenance of good posture become increasingly difficult and complications, relating to breathing and the heart for example, are more likely. The condition is severe enough to shorten life expectancy but with high standards of medical care young men with Duchenne muscular dystrophy are often living well into their 30s. The prognosis for girls is harder to predict as the condition is so rare in girls. If very little or no dystrophin protein is produced in the muscles the course of the disease is likely to be similar to boys with DMD. If some dystrophin is produced the condition may be less severe and progress more slowly. A gradual deterioration in lung function occurs as respiratory muscles weaken. The early treatment of colds and the prevention of chest infections are important. People with DMD should never smoke or be subjected to a smoke-filled atmosphere by family members or friends. Surgery for the prevention of scoliosis and special physiotherapy techniques can assist to maintain lung function. However, as mobility decreases during the stage of wheelchair dependency, eventual respiratory difficulties become almost inevitable. These problems often begin at night causing disrupted sleep. Family members and caregivers must watch carefully for signs of morning drowsiness, lack of concentration, headache, and confusion, sleepiness during the daytime and wakefulness during the night with an increased need to be turned. Regular assessment by a respiratory specialist is essential. When they become necessary, non-invasive ventilation machines are offered to assist with breathing during the night and to allow effective sleep. For the DMD children, this is often the chosen option and, from his perspective, satisfactory quality of life can be retained. This option does require commitment from reliable caregivers whether they are parents, if the person is living at home, or professional caregivers if independent living arrangements have been made. Eventually ventilation will also be need during the day. DMD can affect the heart in one of two ways. Firstly the conduction tissue may be damaged, resulting in abnormal heart rhythms (the heart beating too fast or too slow). These can lead to symptoms such as dizzy spells, palpitations or blackouts. Fast rhythms can be treated and prevented with drug therapy. Slow rhythms are usually caused by a heart block and treatment may require insertion of a pacemaker (a minor operation carried out under local anaesthetic). Secondly, there may be a problem with the pumping action of the heart, called cardiomyopathy, symptoms such breathlessness may occur. Drug treatment is given to improve the heart’s pumping action. Often heart problems can occur without any symptoms so it is very important to have frequent heart checks so that treatment can start as early as possible. Cardiac function should be checked at least once every two years until the age of ten and yearly after that, or as soon as symptoms arise. Female carriers who show no signs of (or very slight) muscle weakness may have some cardiomyopathy and should also have regular assessments. The majority (about 65%) of boys with DMD have normal intellectual ability and show average or above average intelligence. However, intellectual problems or learning difficulties occur in approximately 35% of boys with DMD. In these cases it is thought that the affected children have difficulty with receiving and storing information and then retrieving it later. Learning problems in DMD are not progressive and most boys catch up when they receive good help. Behavioural difficulties may also be present which affect the boy’s social interaction at home, at school and in all areas of his life and for which he and his family will require support and assistance. You may be relieved to know that the muscle deterioration in DMD isn’t usually painful in itself. Some people report muscle cramps at times; these can usually be treated with over-the-counter pain relievers. Pain sometimes results from problems with posture which can be managed by the provision of appropriate orthoses (braces), seating, bedding, and mobility aids as well as standard drug treatment approaches (e.g. muscle relaxants, anti-inflammatory medications). Also, since muscular dystrophy doesn’t affect nerves directly, normal sensations of touch and other senses are retained by boys and men with DMD. They also usually have control over the involuntary, muscles of the bladder and bowel, and have normal sexual functions. There is no cure for DMD at this time, but there continues to be a tremendous amount of research taking place across the world. Researchers have made great advances in their knowledge of DMD and continue to search for a cure. There are also measures that can help manage the condition and improve quality of life (please read more below about the management of a child with DMD). This approach aims to skip the faulty section of the gene so that dystrophin protein can be produced, albeit in a shortened form. It is hoped that this will drastically reduce the symptoms of DMD to a severity similar to that experienced by people with Becker muscular dystrophy. Two similar exon skipping technologies are currently being tested in clinical trial – by the companies Sarepta Therapeutics and BioMarin (formerly Prosensa). The molecular patches that are most advanced have been given the names ‘eteplirsen’ and ‘drisapersen’ and they are both designed to skip exon 51 of the dystrophin gene which could help about 13 percent of boys with DMD. Results from the phase 2 trials of eteplirsen (Sarepta) are looking promising with dystrophin produced in the muscles and walking ability stabilised. The results should be viewed with caution though because testing has so far only occurred in a small number of patients. In October 2014 Sarepta Therapeutics started a phase 3 clinical trial of eteplirsen in the USA. Unfortunately a large phase 3 clinical trial of drisapersen (Prosensa/BioMarin) did not prove drisapersen to be effective. The trial tested drisapersen in 186 boys from 20 countries around the world (not Australia) for 48 weeks. However, it has since been revealed that, based on more clinical trial results, it may work if boys are treated younger and for longer. In November 2014 US pharmaceutical company BioMarin bought Dutch biotech company Prosensa and in April 2015 BioMarin announced that it had completed the application to the Food and Drug Administration (FDA) in the US for regulatory approval of drisapersen. This is the first submission to the FDA for a DMD drug and they also intend to submit an application to the European Medicines Agency in mid-2015. A separate application will be required to the Australian Therapeutic Drugs Administration before drisapersen would become available here. In the meantime, all boys with Duchenne MD who previously participated in the Prosensa drisapersen trials will have the opportunity to enrol in an extension trial and receive more doses of the drug. This includes two trial sites in Australia – Melbourne and Sydney. The aim of gene therapy for DMD is to introduce a healthy synthetic copy of the dystrophin gene into the muscles so that dystrophin protein can be made. Several challenges exist with this approach. Firstly, the dystrophin gene is too large to fit inside the virus used to deliver it to the muscles. To address this, scientists have produced a shortened version of the gene by removing non-essential parts. This shortened gene is called mini-dystrophin and it is similar to the gene that some mildly affected men with Becker MD have. Secondly, the body may recognise the virus or the newly synthesised dystrophin protein as foreign and mount an immune response against it which would drastically reduce the effectiveness of the therapy. Indeed this is what happened in a small clinical trial testing mini-dystrophin gene therapy in boys with DMD. Research is ongoing to understand this immune response and find ways to avoid it before another clinical trial is started. Drugs that suppress the immune system may need to be given and it is also thought that the way the gene therapy is designed and administered may help to avoid an immune response. Translarna (previously called Ataluren and PTC124) is an oral drug that targets a specific type of mistake in the genetic code, called a ‘nonsense mutation’, which affects approximately 10 to 15 percent of boys with DMD. This is when a stop signal is present part way through the gene. Ataluren encourages the cell to ignore this stop signal and continue to read the full set of instructions contained within the gene. Ataluren has been tested for DMD in a phase 2b clinical trial which showed that it may be able to slow down the rate of decline in walking ability. A larger phase 3 trial is underway to confirm these results. Translarna has already been given conditional approval for sale in Europe prior to completion of the phase 3 trial. This is the first ever drug licenced to treat the underlying genetic cause of Duchenne MD. Approval for Translarna in Australia will require a separate application to the Australian Therapeutic Goods Administration (TGA), and no plans to do so have been announced yet. However, the phase 3 clinical trial will be recruiting patients in Melbourne and Sydney. Researchers are also investigating alternative drugs to ataluren that may be more effective at reading through stop signals, but these are not yet ready to be tested in clinical trial. In this procedure donor cells are injected into damaged muscle in the hope that they will fuse with the diseased muscle and create some healthy muscle fibres. Promising results have been obtained in mouse and dog models with stem cells called ‘mesangioblasts’. Mesangioblasts are stem cells found in the walls of blood vessels that under the right conditions can develop into muscle cells. Mesangioblasts have the ability to travel through the blood stream and make their way into the muscles. A clinical trial is ongoing in Italy to assess the safety of transplantation of mesangioblasts (obtained from unaffected brothers) into DMD patients but no results are yet available. Challenges with this approach will still need to be overcome. Transplantation of donor cells will elicit an immune response (like the transplantation of any tissue into another person). It may be possible to give drugs that suppress the immune system. This is standard treatment for individuals receiving an organ transplant. Unfortunately, chronic treatment with these drugs is not without side effects. Scientists are also working on ways in which the patient’s own stem cells could be isolated, grown in the lab, the genetic defect corrected with gene therapy and transplanted back into the patient. Our bodies naturally make a protein similar to dystrophin called utrophin in small amounts. It is thought that utrophin may be able to compensate for the lack of dystrophin in boys with DMD. This approach has the advantage that it could be used to treat all boys with Duchenne MD, no matter what their genetic mutation is. New drugs that appear to work better (in mice) than SMT 1100 have also been discovered in the laboratory which may be tested in clinical trial in the future. Another strategy for the development of a treatment for MD is to boost muscle growth. One way to do this is to interfere with the mechanisms naturally present in the muscle that put the “brakes” on muscle growth so that muscles remain within the normal size range. The “brakes” are a protein called myostatin and blocking this protein could result in increased muscle growth and strength. The results of a phase 1 trial of this gene therapy involving six Becker MD patients were published in January 2015 and on the back of these positive results, another trial in boys with Duchenne MD was started in April 2015. Various drugs are being investigated for their ability to treat the symptoms of DMD and slow down disease progression. In DMD the muscle fibres are continuously damaged when the muscles contract. This causes inflammation which further damages the muscles leading to muscle wasting and the accumulation of scar tissue (‘fibrosis’). Drugs are being researched that could improve the ability of the body to repair damaged muscle, suppress inflammation and inhibit scar tissue formation. An example of this approach is a drug discovered by researchers in the USA that could replace the corticosteroid drugs such as prednisolone currently used to treat Duchenne MD. In studies in mice the drug – called VBP15 – worked better than prednisolone without the harsh side effects. A clinical trial of VBP15 started in February 2015. Idebenone (also known as Raxone or Catena), an antioxidant similar to coenzyme Q10, has been tested in clinical trial for Duchenne MD. Swiss pharmaceutical company Santhera conducted the trials and the results of the phase 3 trial were published in May 2015. The results showed that idebenone was able to significantly slow the decline in breathing ability. These results have led to the study being hailed “the first ever successful phase 3 trial in DMD.” Importantly, treatment with idebenone was safe and well tolerated. Santhera is engaging in talks with drug regulators regarding the licensing of this medicine and applications for its regulatory approval are anticipated in the near future. NOTE: Research is moving forward at a fast pace, so this research summary may not be up-to-date at the time of reading. As mentioned earlier, at present there is no treatment that can overcome progressive muscle weakness in the long term. However, there are management options that can assist with the condition by minimising the secondary complications of muscle deterioration. These will vary as the condition progresses. A team of medical professionals will assist those with DMD and his family with this management programme. The team is headed by a paediatric neurologist and includes a physiotherapist and occupational therapist initially, together with specialists in other areas as required. Exercise, both active and passive, is an important aspect in the management of boys with DMD. Up to the age of around eight years, boys will participate in normal play exercise as far as he is able. It is important that he is not pushed to the point of exhaustion; too much exercise or the wrong type of exercise can cause additional muscle damage. Swimming or hydrotherapy is a good way to exercise without putting undue stress on muscles. The buoyancy of the water gives great assistance to weak muscles and breath holding underwater allows exercising of the respiratory muscles. This form of exercise can be enjoyed long after walking is too difficult. Some boys continue to enjoy water sports well into their twenties. From approximately six to eight years of age onwards, boys will require a manual wheelchair in order to manage longer distances. From about nine years of age an electric or power wheelchair enables the boys to maintain their independence when walking is becoming too difficult and falls more frequent. Many boys continue to participate in sports with their peers using their wheelchairs. Some, as they grow older, become involved in organised wheelchair sports. Passive exercise, or assisted stretching, should be established as early as possible. Through the physiotherapist, exercise programmes are developed which aim to prevent, as far as possible, the shortening of muscles or ‘contracture’, which can limit the movement of joints. These exercises are undertaken on a daily basis and require the involvement of parents and/or caregivers. Night splints are prescribed in an attempt to provide a more prolonged stretch in the calf and ankle. These splints will help to maintain the ankle joint in a normal position and prevent the development of contractures (muscle tightness). The use of standing frames during some part of the school day, once wheelchair dependent can be beneficial. Standing can assist with general circulation and provide a stretch at the ankles, hips and knees. Seating systems offer individualised support to maintain an upright position in the wheelchair and to ensure comfort. As the disorder progresses and mobility decreases, a manual wheelchair will need to be replaced by a powered wheelchair which will help to retain as much independence as possible. Other types of supportive equipment will be available as the need arises and advice concerning these will be offered by the physiotherapist, the occupational therapist and/or by the MDA. It is wise to consider the suitability of the home environment at an early stage so that future adjustments can be made over time. For example, when a powered wheelchair becomes necessary, a suitable vehicle for transportation, as well as access and adjacent parking space, will also be required. Space for a ramp will be necessary and doorways need to be wide enough to allow a wheelchair to pass through. If the house has stairs between levels this will compromise accessibility. The bathroom will generally require modification so that equipment can be used to assist with bathing, dressing and toileting tasks. Medication in the form of a type of steroid treatment (also called glucocorticoids or corticosteroids) has been proven to slow the loss of muscle function and therefore temporarily prolong a boy’s mobility. On average boys taking steroids are able to walk for three years longer and the onset of breathing and heart problems and curvature of the spine may also be delayed. Since steroid treatment was introduced more than 20 years ago the life expectancy of individuals with DMD has increased considerably, but it is not known if this is due to the steroids or the introduction of other measures to manage the condition such as ventilation. If the child’s neurologist, after discussion with the child and family concerned, considers this form of treatment to be suitable, he or she will decide at what age this should commence and what the appropriate treatment programme should be. If this option is chosen, the family should be carefully informed of possible side effects. The most prevalent of these are weight gain, osteoporosis (weakening of bones) and behavioural problems. It is essential that measures be put in place to anticipate side effects and prevent them become severe. Excessive weight gain leading to obesity can occur not only as a side effect of steroid treatment, but also from reduced activity as a result of muscle weakness. Obesity can impair breathing function, may affect heart and bowel function (constipation is often a problem in DMD) and creates lifting difficulties for family and carers. To prevent excessive weight gain it is essential that weight is monitored and that a good balanced diet is followed. Parents, grandparents and other family members and friends can assist by offering healthy foods including the recommended high intake of fluid, fibre, fresh fruit and vegetables and restricting foods which contain high levels of fat and sugar. Boys and teenagers who are overweight or underweight should receive individualised advice from their doctor or dietician to safely manage their nutritional status. It is also important to realise that eating more protein will not have any effect on the lack of protein present in the muscles of boys suffering from DMD. Surgery is sometimes required to release contracture (tightness) at the ankle joints. This procedure is usually done once the child is wheelchair dependent. It helps improve their foot position for wearing shoes, increases the comfort of the resting foot posture and for a few it prolongs mobility. As the spinal muscles become progressively weaker and mobility decreases, the spine may begin to curve – this is referred to as ‘scoliosis’. Scoliosis, in turn, causes other complications such as respiratory problems as well as postural discomfort both sitting and sleeping. It is advisable that scoliosis is corrected by surgery at the ideal time during a ‘window of opportunity’ which takes into account the boy’s stage of adolescent growth. The medical team, headed by the neurologist, will discuss this option with the boy and his family well before the surgery becomes necessary and will have appropriate input from an orthopaedic surgeon. Boys with DMD who undergo this ‘spinal fusion’ surgery are usually very pleased with the outcome. There are two schooling options to consider: mainstream or special schooling. In Australia all children with DMD have the right to attend a mainstream school. Each child should be given an individualised education plan (IEP) to get appropriate help with physical and educational needs. This includes the opportunity to learn computer skills – skills that will be important for him later when his muscle weakness makes writing difficult. He will become increasingly dependent on the use of his computer during his teenage years. Additional government funding called integration funding should be applied for by the school to ensure your son receives enough assistance (teachers aid time) at school to fully access the school curriculum. This integration funding also ensures that a physiotherapist and occupational therapist can be employed by the school to assess his needs regularly and ensure that the school environment is accessible as his needs change. The level of integration funding should be reviewed on a yearly basis. If there are problems with verbal and communication skills then development of creative skills can be encouraged. Often boys with DMD are further disabled by the attitudes of those around them – they may be over-protected or patronised. It is important that they are offered the educational opportunities to be productive and mentally stimulated. The difficulty of facing the inevitability of death from DMD can sometimes prevent acceptance of this final outcome. Ongoing open communication within the family is important and the boy’s questions should be answered honestly and with sensitivity when they arise. The family doctor and his related specialists are important members of the support team at all times and particularly during the terminal stage. The MDA can also guide and support families needing assistance to cope with grief and loss. Communication is a key word in the coping process. If parents can speak openly and honestly with each other, sharing concerns and discussing ways to meet challenges, the whole family will benefit. Begin by asking the members of the medical profession and other support people all the questions that come to mind. Read everything that is available to you about DMD and continue to read in the future about current developments. Your son will ask questions and you will be better qualified to answer these openly and honestly if you are prepared with as much information as possible. Listen to him carefully and talk about the questions he asks and the issues he raises. Be open and approachable. Encourage him to discuss his needs, learn to ask others for assistance when he needs it and politely refuse when he can manage independently. As noted above, smoking can be particularly harmful to the individual affected by DMD and the whole family should be aware of this. A healthy diet, with restriction on foods containing high levels of fat and sugar, and including plenty of fluids, fruit and vegetables can be encouraged. As parents, you can encourage special interests, physical exercise such as swimming, according to his mobility, and relationships with peers. Your son does not need to be over-protected. He needs support, love, a warm and caring family environment and not least, the encouragement to live life as fully as possible with his friends and family. Many families living with DMD develop their own special activities and are able to continue to enjoy, rather than restrict, these family activities. You will need to adapt to living with DMD but it does not need to dominate your lives. Rather than leaving the majority of the additional responsibilities to one family member, it is advisable to involve all family members as much as possible. Each one deserves help, understanding and at times respite (time out). Try to find a balance with space and time for all relationships – partners, parents with other children, siblings with each other, extended family and friends. Creating new friendships with other DMD families (or families living with other disabilities) can be rewarding for all concerned. The MDA understands how difficult it is for parents and other family members to accept the diagnosis of DMD. Various stages occur in the coping process and these will vary through time. There will be times when you are suffering feelings of loss and grief, anger, resentment and guilt. There will be other times when you will feel quite positive emotions and a degree of acceptance. The MDA’s client services advisers are available to discuss concerns and provide information and support. DMD – A Guide For Parents. A comprehensive guide. You can get regular updates by becoming a friend of the MDA Facebook page.